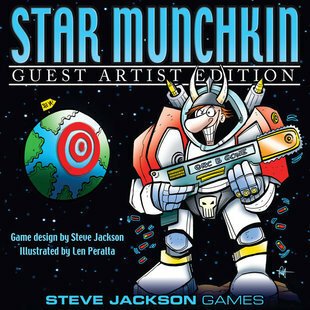 Daily Illuminator: Star Munchkin Guest Artist Edition In Stores Now! 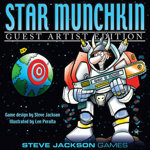 March 7, 2016: Star Munchkin Guest Artist Edition In Stores Now! As an astronaut returns to earth, our own star-man Len Peralta has finally landed on store shelves with Star Munchkin Guest Artist Edition! It's the second game of our Guest Artist Edition series, and has already received a stellar response. Presale stock sold out at PAX South in a mind blowing 24 hours! Len's new art gives all the visual jokes of the original Star Munchkin a clever twist, with his own comic styling. We've worked with Len in the past, and we are very excited about his upcoming work, including Bill and Ted's Excellent Boardgame! He's got some speed drawings of his work on that cover, as well as some Star Munchkin Guest Artist Edition art; check him out in action! Resupply at your FLGS, or visit Warehouse 23 for a copy. It's a limited edition, so if you wait too long, it may be back in orbit!